Summer is flying by with boat rides on Lake Travis, Zilker sunsets, and of course, good ole’ fashioned baseball with the Texas Playboys. Who are the Texas Playboys? Glad you asked! The Texas Playboys are an Austin sandlot baseball club formed by an eclectic bunch of makers and doers around town — architects to musicians and filmmakers. It’s an all-star rotation of team members. At any given game you’ll see the likes of Dan Dyer, Topaz McGarrigle (Golden Dawn Arkestra) and Jesse Ebaugh (Heartless Bastards). Each month, they bring art, music, beer, and baseball to their field fittingly called The Longtime. Here, you’ll find a little pool for the kiddos, a food truck, and maybe someone screen printing bandanas. It’s always a good time at the Longtime. 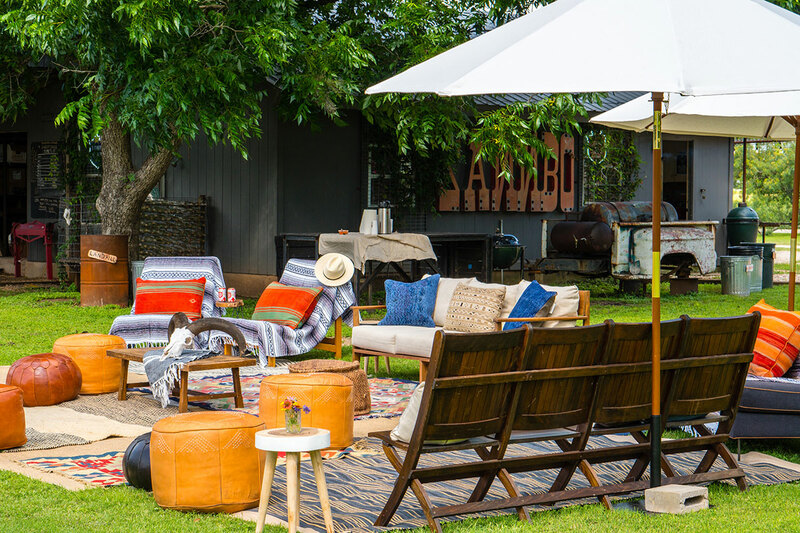 We were gratefully a part of the sandlot baseball revolution when we teamed up with the founder, Jack Sanders, to create a few summer lounges for June’s game. What’s better than a summertime picnic and baseball? Styled by the talented Natalie Holzem, we wanted to put a Tex-Mex spin on the American pastime. Layered rugs, like our Sisal Outdoor Rug and Blue Diamond Flatwoven Rug, created a laid-back look; spectators relaxed on them like picnic blankets. A few low profile couches and lounge chairs transformed the space into an outdoor living room with a real ball game playing instead of one on TV! Add market umbrellas to escape the Texas heat and a few poufs and we couldn’t think of a better scene for kickin’ back and enjoyin’ a cold drink. Is it really Americana themed without a little bit of red, white, and blue? Our vintage american flag added that little bit of spirit and flair. Confession: We tried to get that flag to hang fully open but it kept slipping off. We think the casually thrown up look turned out better! Interested in coming out to a game at The Longtime? Sign up on for the fan (“Nut”) newsletter here and get notified of games and other Texas Playboys Baseball related events. Read more about Texas Playboys Baseball in Garden & Gun, Texas Monthly, and Tribeza. Love these guys!